It’s Halloween night and I’m still on my sugar high. Mr. Crash has now gone to bed so we’ll see how he is tomorrow. Or how I am tomorrow. Or Kevin. One thing’s for sure–we did get a lot of great loot. Tuxedo Mickey was a hit for people who recognized it. We got an alarming number of “and what are you?” I mean seriously–HAVE YOU NEVER SEEN TUXEDO MICKEY WHAT DO YOU THINK THESE MOUSE EARS ARE FOR????? 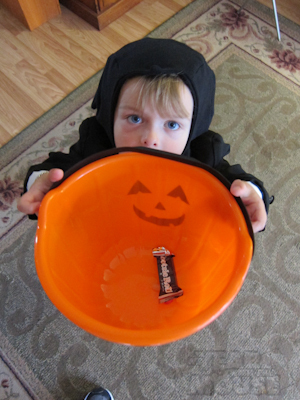 Photography was difficult, as is usual with a toddler and by the fact that he refused to let go of his pumpkin bucket. And I mean refused. The tears! The drama! 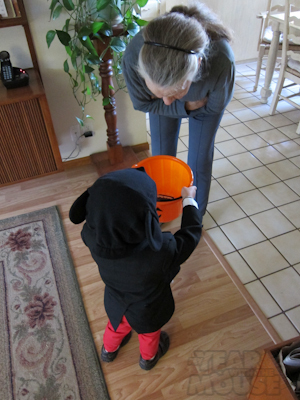 Oh cruel, cruel world who would take a pumpkin bucket from a small child! 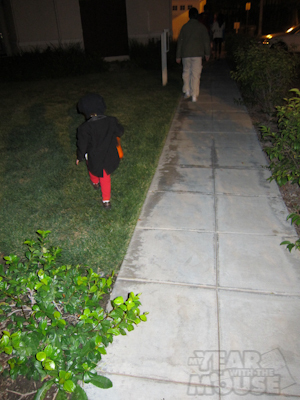 First step of the night was to Theo’s Great-Grandparents house. We are so incredibly lucky that Theo has 3 great-grandparents! 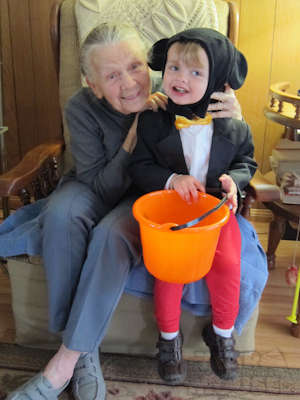 Then practiced his mad trick or treating skillz with Great-Grandma. And then did a close inspection of his haul. One piece of candy? It's like you people survived the Depression or something! And then, in his best Oliver Twist impression, Theo ramped up the pathos. 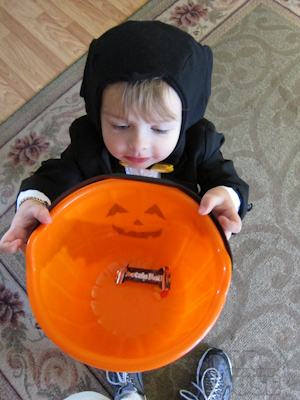 His Dickensian affect must have worked because he did leave with more than one Tootsie Roll. 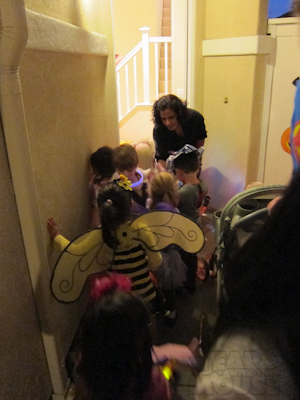 We then headed over to Kristin’s, who has a bunch of kids in her neighborhood, hence a bunch of trick or treating. 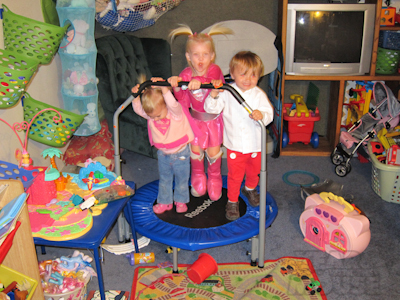 We ran into several groups of kids. 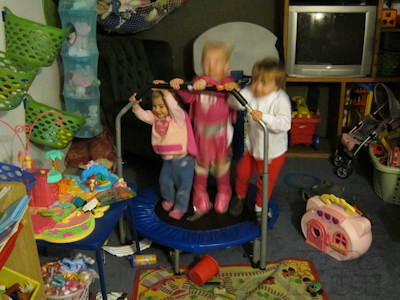 Theo is in this group--I swear. 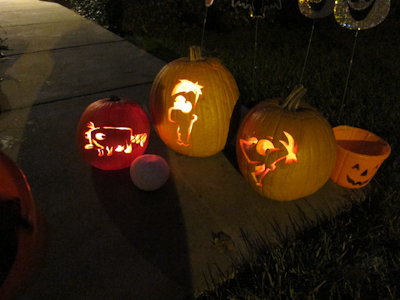 I saw those stencils online and fully intended to make some myself, but we ran out of time and ended up carving no pumpkin at all this Halloween. 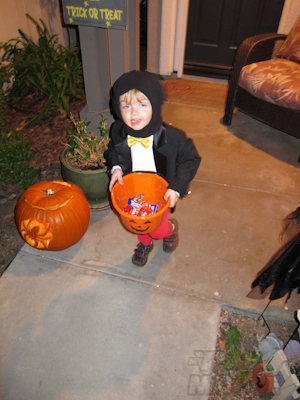 I cannot believe we deprived our son of this most joyous of Halloween traditions (besides the candy grab, that is). Let’s just add it to the therapy bill. 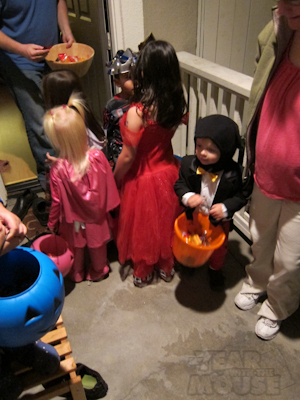 The sugar rush started to catch on before we even stopped trick or treating. I swear I've had nothing to drink, officer! 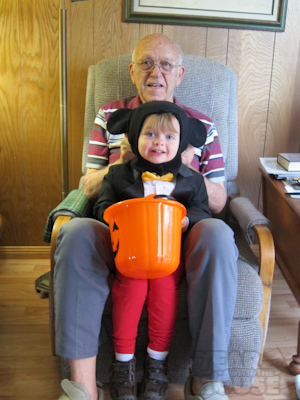 But post-trick or treating, the sugar high became too much. Ok, so the haircut entry has been my previous favorite but this may take it’s spot! I think it’s funny that you live in Mickey’s backyard, and people did not know that he was supposed to be Mickey.